For centuries, humans around the globe have used their bodies as a living canvas by permanently marking their skin with ink. We have even recently discovered evidence of the practice dating as far back as Neolithic times, and over the years the ink has been utilized for everything from memorializing loved ones to marking cultural milestones. With such a rich history, I am proud to report that the majority of today’s tattooed celebrities have accepted such an important mantle with the dignity and respect it deserves. Unfortunately, I was unable to locate specific examples of the aforementioned dignity and respect so instead I created a celebrity tattoo checklist to prevent temporary lapses in judgment from becoming permanent reminders of ineptitude. Rule 1 – Proofreading is essential, especially if the tattoo’s text does not appear in your native language. Rule 2 – Do not get a tattoo of you current spouse. 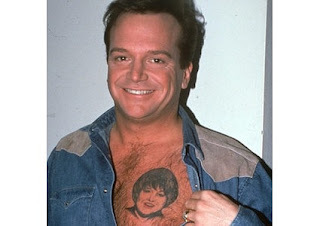 I am fairly certain that the statute of limitations on jaywalking could easily outlast most celebrity relationships so it is unwise to commemorate your soon-to-be ex-spouse on your body. Keep in mind that none of the mistakes listed below can be explained away by naivety since each subject was on at least their second spouse by the time they got inked. 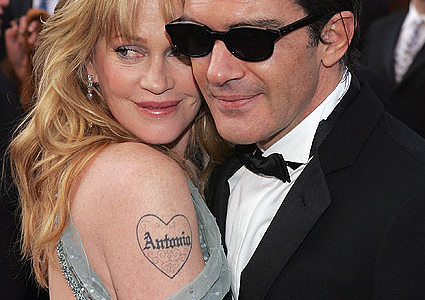 Melanie Griffith apparently decided there was no better way to proclaim her love for Antonio Banderas than to have an inmate at Riker’s Island frame his name in a heart. I have seen more artistic fare carved into the prophylactic dispenser at a Pilot truck-stop. Denise Richards bet 1 ½ inches of her ankle space that Charlie Sheen was a dedicated family man whose commitment to monogamy would only be surpassed by his emotional stability. Denise Richards now has a two inch tattoo of a fairy on her ankle. Angelina Jolie got the words “Billy Bob” tattooed on her arm. Getting a tattoo that said "Billy Bob" would even be a mistake for someone actually named Billy-Bob. Johnny Depp got "Winona Forever" tattooed across his back during his relationship with Winona Ryder. After the couple split, Depp decided to class up his ink which now reads “Wino Forever” as a permanent tribute to the symbiotic relationship between alcoholism and chronic homelessness. Despite Dean McDermott’s prominent arm tattoo of Tori Spelling from the bosom up, he was granted American citizenship last year. And they tell us the border is secure…. Rule 3 – It is unnecessary to tattoo your own name on your body, especially after you have paid countless PR firms to make sure we already know what it is. 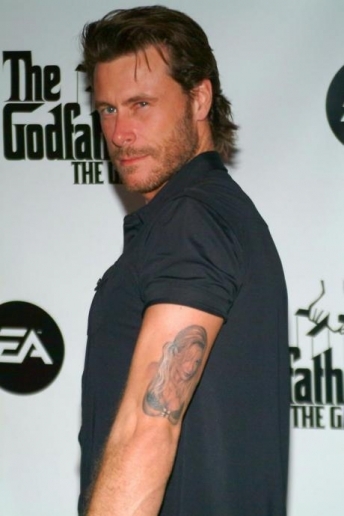 Aside from Guy Pierce in Memento, there is no excuse for tattooing your name on your body. Mark Wahlberg’s participation in Boston’s experimental ident-a-kid program was as unsuccessful as his anti-smoking campaign. Nichole Richie has “Richie” tattooed on her neck and “Virgin” tattooed on her wrist. Some have crassly observed that only one of these tattoos would be useful in identifying her. 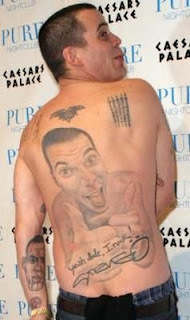 Always willing to go the extra mile, Steve-O decided to turn his back into a tribute to his front. The result is every bit as troubling and detailed as an amber alert. Rule 4 – Never, under any circumstances should you get a tattoo of Roseanne Barr. Rule 5 - Excessive face tattoos are only for serial killers and rappers with legal problems. Several weeks ago, rapper Gucci Mane was committed to a psychiatric facility after pleading "mental incompetency" at a parole violation hearing. 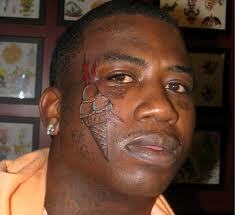 Immediately upon his release, Mr. Mane cemented his plea by paying someone to tattoo a waffle cone with 3-scoops of ice cream onto his face. America owes Mike Tyson an apology. Lil Wayne is know for his dedication to body art, and he sealed that commitment by getting eyelid ink in addition to a series of tears; one of which is close enough to the side of his mouth to count as spittle. I couldn't get a tattoo if you paid me. I'm terrified of needles. But even if I wasn't and I was inclined to have something permanently etched on my body, it wouldn't be a name of any description. I'm sure I've read a story where someone got a tattoo of a footballer's name, only for that footballer to leave and join a rival team. Despite a bit of sniggering to myself and the observation that she must have at least one regret now, I do feel quite sorry for Hayden. It sounds like a typo more than anything else. That said, she should still have consulted a translation agency, and given the tattooist the text that they came back with. I share some of your sympathy for Hayden, but at the same time if I am going to acquire a tattoo that covers my entire rib-cage I would be absolutely certain is was spelled correctly. If she provided it correctly but the tattoo artist made a mistake that is a much different scenario than if she provided it wrong in the first place. well all that was rough! the dude with tats on his eyes...O.U.C.H!!! Josh and I saw a guy that had tatoos for eyebrows, it was like names of his kids or something, ok well and they weren't even!! really dude!? plus his bald head was tatted as well. Brian I think you might have been mistaken on one thing. You assume that the tattoo "artiest" misspelled those words on people accidentally. But thinking logically if I where a tattoo artist I would probably do it just to be fully. This would especially be true for those wanting to receive Asian characters as those can be especially hard to research without knowing someone who can read the language and is honest. Just think how funny it would be to have some drop dead gorgeous blond come in and tell you she wanted two tattoos in a line down here neck which say "Peace" and "Love" or something of the sort in Chinese and she expects you will know how to do them so instead you put two words which say "Dumb Blond". Knowing good and well no one would probably ever know and anyone who could read it would probably think it so funny they wouldn't tell her just so they could show their friends. Although maybe I am wrong and just a malicious person.